When Bill Thomson signed a copy of his book Chalk for my children at the Mazza Museum in November 2017 he wrote the words, Books are magical along with his signature. 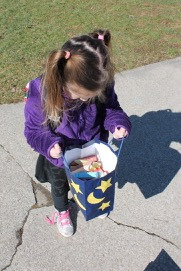 Over the years of writing this blog, I have often been humbled that our birthday celebrations play out the way they do. Sometimes I feel like there is "book magic" watching over us. It's February in Ohio. It should be cold and snowy. 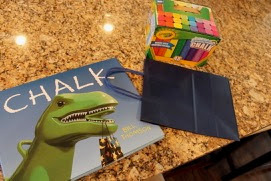 Instead, I found myself at Target, while my daughter was at morning Kindergarten, buying a huge box of sidewalk chalk because it was going to be sunny and over 50 degrees. Yes, Bill Thomson, you are right, books are magical. They can even change the weather in Ohio because by Friday it will be snowing! 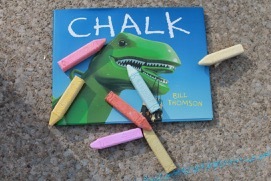 Bill Thomson is the creator of three wordless picture books Chalk, Fossil, and The Typewriter. He also illustrated many books for Carol Nevius including Baseball Hour and Building with Dad. 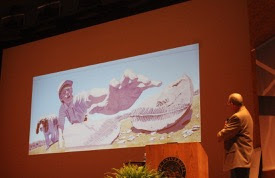 During his presentation at the Mazza Museum, Bill Thomson shared that he has always loved drawing and he had proof. 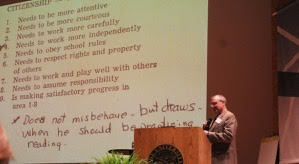 On a report card, under the citizenship standard, his first grade teacher wrote, "Does not misbehave, but draws when he should be practicing reading." Bill Thomson studied illustration at Syracuse University which led him to a successful career as freelance illustrator where he "always had work." After 20 years of illustration experience, he started teaching illustration at the University of Hartford. For the first time in Bill's life he felt like he had "financial freedom" and decided to enter the world of children's books. 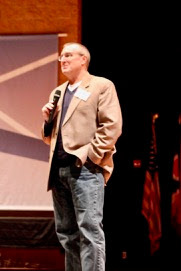 In 2004, he published his first book Karate Hour, written by Carol Nevius. 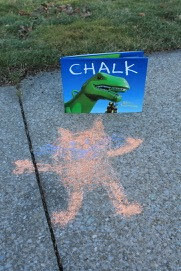 In 2010, Bill published Chalk which was the first book in a wordless picture book trilogy that explores imagination. 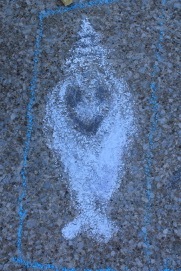 Chalk explores imagination through art. The second book, Fossil explores imagination through science and in the third book, The Typewriter explores imagination through writing. 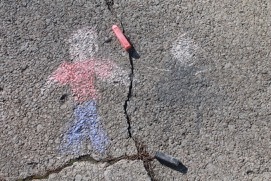 In Chalk, the children discover a bag of chalk at the playground. 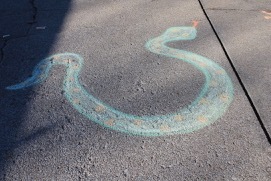 They quickly learn that everything they draw with the chalk comes to life, including a DINOSAUR! This was the book I wanted to explore with my own children for Bill's birthday, however when he told me his birthday was February 28th I figured it would never work out. At that moment, I must have forgot that books are magical. 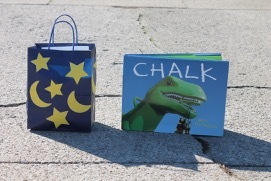 I bought a big box of my favorite sidewalk chalk and a plain dark navy blue gift bag. 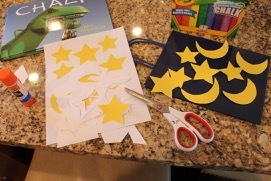 I printed a bunch of stars and moons to make my bag look like the one in the book. 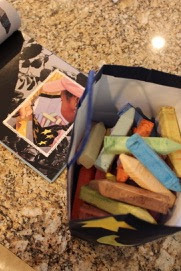 I put all the chalk in the bag so my daughter would be able to find it just like the kids in the book. 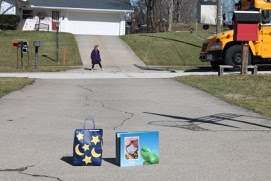 I set the bag and the book in the driveway and waited for my daughter to get off the bus. 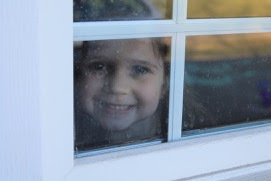 I wanted to hide and just watch her reaction, but the bus driver won't let her off the bus without seeing me! 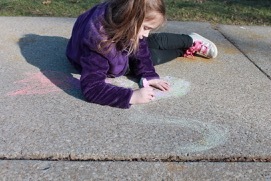 I enjoyed drawing with her on this warm day in February. You know you want to try this with your kids! 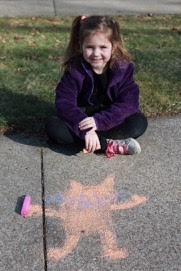 She was very proud of the cat she drew. She had to place a piece of chalk in the cat's paw. This is a drawing she did of the two of us! I was wearing a red shirt with jeans. 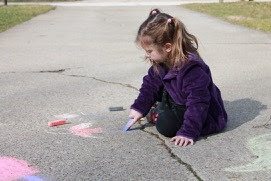 In this photo she is drawing a snake! I hope it doesn't come alive! This narwhal is pretty cute though! He might be fun to play with. 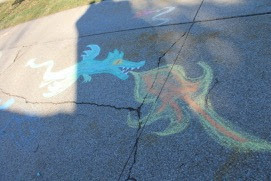 I drew a fire-breathing dragon. 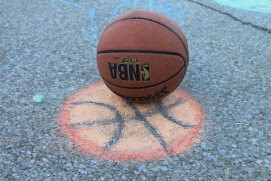 When her brother came home from school someone must of drew a basketball. 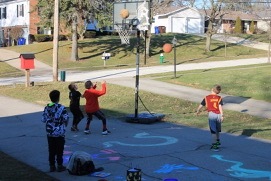 Because while we were inside a neighborhood game came to life! She said she would rather stay inside now. 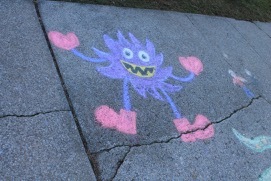 We had a great afternoon with CHALK! Bill, it was so nice to meet and talk with you at Mazza. Your presentation was inspiring! I couldn't help thinking how lucky your students are! Thank you for sharing your birthday with us. I hope you get a big bucket of ice cream, just like the one in The Typewriter, to go along with your birthday cake! We hope you have a wonderful birthday!